Curvy with magnetic collapsible frames. 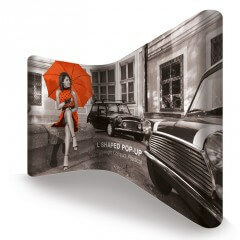 Large enough to make an impact yet can be transported by car, pop up displays have it all. Magnetic tape down each edge of the graphic panels holds them seamlessly on the frame. Our POP-UP BUNDLES include lights and a table top to convert the wheeled case to a counter. 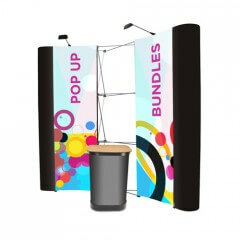 Pop-ups are the second most popular portable exhibition display. Frequently seen in shopping malls and airports pop-ups do have a fairly large footprint but are large, architectural and impressive. 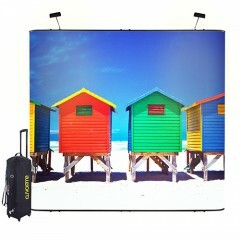 Pop-up display systems have collapsible frames and graphics attached by magnetic strips.